Submitted by Jason Horton on Nov. 26, 2015. Whether you're setting up your first project studio at home, or even if you have quite a bit of experience in this area, you'll find this long list of home studio equipment will cover just about every type of gear you'll need to consider. If you don't want to read through all this recording gear then you can skip ahead for a list of basic gear in a couple of example setups for beginners. Below is an overview of this topic, for a more in-depth look, which covers additional microphone characteristics including polar patters and diaphragm sizes, see: The Different Types Of Microphones and Their Uses . If you're going for a simple set-up where you will only be recording using a microphone or two, instead of recording from gear such as hardware synths or plugging in guitars, then you can get started with USB mics because then you won't need an audio interface. Another good thing about them is that you don't have to worry about phantom power because they take their power directly from the USB connection. If you're using a tablet like the iPad which can't provide enough power for multiple mics then you'll also need to use a self-powered USB hub. If you intend to be record a lot of vocals then you'll want at least one condenser microphone - these are the mics most often used for recording vocals. Condenser mics are much more sensitive than Dynamic Mics and they require Phantom Power to operate. They typically respond to higher frequencies and can pick up more subtleties in dynamic range. Although most often used for recording vocals, they can also be employed to capture acoustic instruments such as guitar. One of the best known examples is the Neumann U87 however the modern variants of it cost over $3,000 so you are much more likely to find an MXL 990 or Rode NT1A in a home studio. For more information see our guide to the best condenser mics under $100. These are the work-horse mics of rock and they can take just about any kind of punishment you can dish out. They're not as sensitive as most other mics both in terms of frequency response and dynamic range (volume differences), but their ability to withstand very high SPLs (Sound Pressure Levels) means you can use them on anything from a kick drum through to vocals. The most famous examples in this category are the Shure SM58 which is used on everything from vocals to instruments, and the Shure SM57 which is usually used on instruments and their amplifiers. Many of these types of mics can be bought in versions which use cables and as part of a wireless mic system. These were invented in the 1920s and produce a signal based on the velocity of the air that hits the ribbon, rather than the displacement of air as in Dynamic Mics. This leads to interesting characteristics such as taming harsh sounds and producing a 'vintage tone' that can be found on many recordings from the 1950s and 1960s. 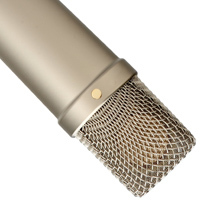 Most modern Ribbon Mics use phantom power (check before using - phantom power can burn out the ribbon if it's not supposed to be used on a particular mic) but they tend to have a greater degree of roll off on the higher frequencies than condenser mics. If you already have dynamic and condensers then you might like to consider getting a Ribbon Mic to add to your tonal pallet when recording. Royer Labs are the leading manufacturer in this category and they won a Technical Grammy in 2013 - their leading model is widely considered to be the Royer 121. Although you can use standard condenser mics on drums, you'll find you get better results with specialty drum mics because they're specifically designed to handle the very high SPLs and specific frequencies of different types of drums. There are different types of drum mics designed specifically for each piece of percussion in a drum kit, including different types of cymbals, and you can buy a drum mic kit which will give you every thing you need to record acoustic drums. In the studio it's best to go for boom style stands because they're the most versatile and can be used to position your mics accurately to record all kinds of instruments and vocals. Here's our guide to Mic Stands for Stage and Studio. These are a necessity for recording vocals because they can save you from having to do unnecessary retakes just because the singer popped or breathed directly on the mic causing the input signal to be clipped or distorted. Place a pop filter between the singer and the microphone, just like the picture on the left, and the problem is largely avoided. Check out our Pop Filter Guide. Open Back - the best frequency response but spill noise out the sides. Closed Back - the best isolation but over emphasize the low end frequencies due to pressure being contained within the cans. Semi Open Back - high end versions provide nearly as good a frequency response as open backed but with limited spill. Ear Buds - they don't sound great but they help to hear what your mix will sound like to people listening with them. An important point with new headphones that sometimes gets overlooked is that they need "breaking in". This is because manufacturers deliberately over tension the speakers for shipment. They need about 12 to 24 hours running at around 80db for the speakers to loosen up to the level that produces the correct frequency response - they will then stay in this correct state for many years. If you don't do this then you'll probably end up with harsh tones during the first 24 hours of actual running time. Although you generally want to do most of your mix downs using studio monitors, you can get away with using high-end open backed headphones if you don't have monitors. Even with monitors, you may still want to check the mix with headphones to see what it sounds like without the acoustic effects of your mixing room coming into play. Finally, you'll benefit from having a set of Ear Buds to check the final mix because many people listen to music using ear buds with their personal music players and smartphones. If you're working on a limited budget then the best bet is simply to go with closed back headphones because they are the most versatile with the least amount of spill. In fact the drummer will benefit from the additional low end making it easier for them to hear the bass in their mix. If you have extra money to spend then consider getting a set of semi open back headphones for recording vocals - their improved frequency response can help to get better a performance from the vocalist while not letting too much of the mix spill into the mic. If you're going for a simple recording set up then you won't really need these because the headphone output from your mixing desk or audio interface will suffice - this is true for most standard consumer headphones. However, if you're going to have multiple people recording simultaneously, and particularly if you're going to be providing different mixes in some of the headphones or you're monitoring with multiple people in a quiet environment, then you will most likely need headphone amps. If you're using high-end open back headphones which tend to be high impedance, particularly for mixing, then you'll also want to get a headphone amp that will drive them at the correct power level. This helps avoid clipping if you're running the headphone output of your audio interface or mixer too loud just to get the volume you want. At its simplest a mixer allows you to take multiple incoming signals and mix them together. More complex mixers may have a range of signal processing tools like EQ built in to every channel and have multiple signal routing options such as multiple busses, groups, inserts and direct outputs. Although your DAW can provide all the functions of a mixer for sound you've already recorded, you will still need one if you want to record simultaneously from more sources than you have channels on your audio interface. For example you might want to record a drum kit with 8 microphones but you only have 2 channels on your audio interface - you will need to send all the mics through a mixer to mix them down to only 2 channels before you send the signals into your interface. These use hard-wired physical circuitry for carrying, processing and routing all the signals you are mixing. They typically have built-in mic preamps and are often used in conjunction with audio interfaces that only accept line level inputs, or in any situation where the number of signals you are recording simultaneously exceeds the number on inputs on your audio interface (see the paragraph above for an example). Although you typically use these the same way as their analog counterparts, most the internal circuitry is 'virtual' running on a computer system inside the hardware. The exception is that the preamps, which are usually the first step in the signal path, are analog and they then pass the signal directly to the A/D converter. Once all the processing is done the signal can either be transferred to your computer in a digital format, or converted back to analog (necessary for monitors and headphones). Some digital mixers also have ethernet and WiFi networking built in for sending audio data or for remote control by a tablet or laptop. These are expensive pieces of equipment and are generally not needed for basic home recording setups. What they do is take multiple line level inputs and mix them into 2 line level outputs - this is essentially the same as sending multiple channels on an analog mixing desk to a stereo bus. There are a range of ways they can be utilized with one the most common uses being to send channels from a DAW to an analog summing mixer to produce a stereo output which is then sent back to the DAW. Some audio engineers do this because they don't like the sound of doing summing mixing ITB (In The Box) and instead prefer the tone of an analog summed mix. There are huge debates over whether or not summing is a good thing - if you'd like to know more see this discussion. You basically have two main options here - whether to use a computer based system or a digital multitrack system. By far, most home recording studios, and even most professional ones, choose to go with computers. Given that most musicians already have a computer this is the most cost effective way to go. These are the devices that capture audio, convert it into a digital signal, then transfer it to your computer. They also take the digital audio from your computer and turn it back into an analog signal for playback through your monitors. Your main considerations in choosing which one to get will be the number of channels you want to record on simultaneously and whether or not it has built-in mic preamps and phantom power - the latter will be determined by the types of microphones you use and whether or not you use a separate mic preamp. You will also need to consider how many inputs are designed for microphones or instruments depending on what you intend to record. Most of the options on the market today support a minimum of 44.1 kHz sampling rate (some go up to 192 kHz) and 16 bit depth which is sufficient for producing release quality music. There is a lot of debate about sampling rates so if you'd like to know more see: The Science of Sample Rates (When Higher Is Better — And When It Isn’t). There are also a number of factors that influence the sound quality and tone an audio interface produces, particularly the mic preamps and D/A & A/D converters it has. Generally speaking, the more you spend the better quality you'll get. Many interfaces also come with "Direct Monitoring" or "Zero Latency Monitoring". This is to ensure that what you're hearing is exactly synchronized to the recorded tracks which is vital to ensure the people playing new tracks are in time with the recording. The problem of latency typically arises when your computer lacks the processing power to send the audio out fast enough - this feature is designed to solve that problem. For more information see our guide to the best cheap audio interfaces with 2 channels. Most home recording systems these days have a PC, Mac, or iPad as the primary recording device with a DAW (Digital Audio Workstation) as the main software for editing, processing, and mixing the audio. Some of the most commonly used DAWs with laptops and destops are Cubase, Cakewalk, ProTools, and Apple Logic. The most popular DAW app for the iPad is GarageBand. There are also many specialty DAWs suited to specific production styles such as EDM like FL Studio and Ableton Live which, as the name suggests, is also used in live performance. It's quite common in small home studios to record in the same room as your computer, and when they get hot computer fans kick in and can make a lot of noise - this is particularly true with laptops. You can try to keep your computer cool either by using a cool or air-conditioned room (you may need to turn the air-con off during recording takes), or you can try a laptop stand. Place the computer as far away as possible from your microphones. Put a sound barrier between the computer and the mics. Put the computer in a separate room and run cables through for the monitor, keyboard and mouse. Copy the big recording studios and use a sound proofed Isobox - this option can be quite expensive. If all else fails you'll need separate recording and control rooms. The iPad doesn't come with a standard USB port so you will need to get a CCK (Camera Connection Kit) if you want to use it with any USB microphones or audio interfaces. One important thing to note is that although you can get generic brand CCK devices you really should only get the Apple CCK for recording audio because many people have found in the past that generic ones don't always continue working properly, or at all, when your version of iOS is upgraded. Also, the amount of power provided to USB by the iPad is limited, so it's best if your USB devices supply they're own power. Android devices are not typically used for recording multitrack music because the Android operating system doesn't provide audio timing guarantees and often produces latency - this may change at some point but there's still no solid indication of when it might happen as of December 2015. These are usually pieces of hardware that you can use to control your DAW, but in some cases they can be DAW Controller or Remote Control apps running on tablets including the iPad. Although these are not necessary because you can do everything you need to in your DAW with a computer keyboard and mouse, they help make your workflow more efficient. Software controllers running on tablets can also be a convenient way to remotely control your DAW - this can be particularly useful if you have a separate sound booth and control room but you need to control the DAW while recording on your own. These are essentially a computer and a mixing desk with AD/DA converters integrated into a single piece of hardware. Although these aren't as flexible as using a computer because you can't change your main DAW software, they are extremely reliable and you don't get the problems you sometimes do with trying to get all your software and hardware to work together on a computer based system. Although they can be more intuitive to use than many computer based systems, they have become less popular over the last few years prompting manufacturers to add features such as making them work as audio interfaces,samplers and DAW controllers, which in turn has made them much more attractive to budget conscious musicians and producers. Take a look at our guide to The Best Multitrack Recorders. Your studio monitor speakers, sometimes refereed to as reference monitors, are one of the most important pieces of a good home studio. The main thing you want to look for are ones that provide a flat response across the spectrum of frequencies that humans can hear - this is typically from 20 Hz to 20 kHz. The point is that you don't want your studio monitors to "improve" the sound like you might want in a Hi/Fi system, instead you want them to be as accurate as possible because you need to hear it warts and all in order to get the best possible mix. They are called passive because they don't have amplifiers built into them. 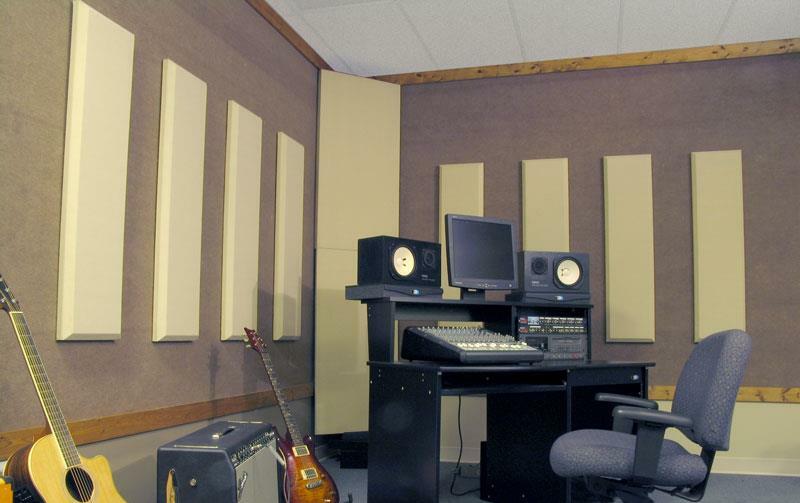 Passive monitors were originally the main type of reference speaker used in professional studios. If you choose to go passive then you need to be very careful that you match them with the right kind of amplifiers and crossovers in order to get the flat response you're looking for. One of the most famous examples was the Yamaha NS-10. Active studio monitors have amplifiers and crossovers built in and are the most common type found in home studios - they are also found in many professional studios these days. They offer a range of benefits including the fact that you don't need to have additional amps or the need to worry about pairing them correctly to the speakers - you can basically take them out of the box and plug them in. The KRK Rokit series and the Yamaha HS series are two of the best examples of active monitors that you'll find in both home and professional studios, and both brands are featured in our gear guide to the best studio monitors under $1,000..
Subwoofers do the exact opposite of providing a flat response - they magnify the bottom end. If you are making special mixes to be used in dance clubs, or for film and television, then you would very likely want to hear how the mix will sound in those settings. Many people also find them quite useful for taking the bottom-end load off their main monitors which helps them to produce a clearer and crisper sound. For more information see our Studio Monitor Subwoofer Guide. Again, these types of multiple speaker systems are typically only needed for producing music that will be played primarily in special settings such as commercial and home theaters. These are the type of amplifier you need to get if you're using passive studio monitors and they're also sometimes used in studios to power headphones as well. These allow you to take in multiple audio channels and produce personalized mixes for multiple people. These are particularly useful when recording multiple parts simultaneously with different musicians needing to hear a different mix. Some even come with built in effects. Monitor Management units make it easier to manage and route signals to different sets of monitors and/or headphones. You can use them for instantly switching between multiple monitors and some have additional features for sending different cue mixes to different sets of headphones. Some also include talkback functions so you can speak to the musicians in the sound booth when you have a separate control room. See the Mixing / Monitoring headphone section above. Here we are specifically referring to outboard gear, rather than the signal processing you do inside your computer, and this equipment is typically mounted in racks although some items can be designed to sit on a desktop. These are typically the most transparent, meaning that they don't color the tone, and they are typically able to produce a lot of gain with very little distortion. Some people just love the sound of vacuum tubes and like to use these to add warmth to the microphone. These offer some of the sonic features of both solid state and tube preamps by using both types of circuitry to amplify the signal. Usually they use solid state circuits at the input stage and then a tube in the final gain stage. These generally start off with a solid state circuit for the input, then the signal is digitized so that its internal software can then produce a sound which replicates large numbers of different kinds of preamps, both classic and modern. You will find the following buying guide on this topic quite useful: The Best Microphone Preamps. These are essentially preamps with the kind of additional signal processing that is found on a single channel of a mixer such as a compressor, equalizer, exciter, and even a de-esser. Different channel strips come with different combinations of signal processors. To see some examples take a look at our best channel strip guide. A compressor reduces the dynamic range of a signal - in other words it reduces the difference between the loudest and quietest levels. This is very useful for getting consistent levels recorded. Compression rates are measured as a ratio - 4:1 would mean every 4dB increase in input will only lead to a 1dB increase in output. A limiter places an upper ceiling on the output level to prevent clipping - in the digital world clipping instantly becomes distortion. You can use hardware compressors and limiters at the input stage before your signal reaches your audio interface, and you can also use software plugins in your DAW to process signals that have already been recorded - obviously when you use software versions they can't prevent clipping on the input signal. Noise gates and expanders are used to cut the output signal once the input level drops below the threshold you've set. Gates act more like an on/off switch when the threshold is reached, while an expander attenuates the output in relation to the input - a bit like the way compressors work but in reverse. These are particularly useful for recording loud sound sources such as drums and guitar amps. When recording drums this will help to prevent spill between the various drum tracks, and with guitar amplifiers this will cut out the hum of the amp when the guitarist isn't playing. These take the input signal and break it up into frequency ranges called bands and you control the level of each band typically with a fader like control - if only 3 bands are used then they might be knobs instead, EG a band for Bass, Middle, and Treble. In a recording setting you will typically use a large number of bands - most commonly 15 or 31 bands on hardware equalizers. These give you a more precise level of control over a narrow range. You generally have 3 parameters you can adjust: the center frequency, the bandwidth, and the volume. So you select a center frequency, then dial in the bandwidth which determines how many frequencies either side of the center will be effected, then turn the volume (amplitude) up or down. Although just about any signal processing device can be considered an "effect", here we're specifically using the term to describe processing that does more than influence the tone - the primary effects you'll use are reverb and delay. Although all types of effects can be found in software/plugins there are still many who prefer using outboard gear. While producers and engineers can argue at length about the sonic quality of specific hardware units over their software counterparts, we won't get into this debate here. The only point we'll make is that using outboard gear does reduce the load on your computer when you don't have to run as many plugins. Lexicon are one of the most famous brands when it comes to reverb. These devices are used to brighten up or add sparkle to a track - often vocals. They overcome some of the limitations of EQ which boosts specific frequencies but can boost high range hiss as well. Exciters work by modifying frequencies dynamically in relation to their input volumes, adding in some harmonic synthesis, and even adding some subtle harmonic distortion. The most famous example is the Aphex Aural Exciter which popularized this effect in the 1970s. This is a topic which is a bit too complex to go into detail right here, so if you'd like to know more about exciters see How Enhancers Work. These are signal processing units that do the same things as all the others discussed here, but they come in a smaller format and are designed to drop into a special 500 series rack and can be easily mixed and matched. Because they are more compact than their full sized rack mounted counterparts they are also easy to carry around. One of the factors that have been driving their popularity in home recording studios is that they also tend to be cheaper than full sized units. The cost savings are partly achieved because the rack in which they sit provides the power and the signal inputs and outputs. If you have the old style racks you can even get 500 series chassis which are rack mountable. The process of taking the final mix and producing the Master copy from which all copies for distribution will be made, is a task which requires a perfect listening environment, excellent equipment, and a lot of experience - if you want it done well. Mastering can be done on computers, but there are still many mastering engineers who prefer to use high-end hardware. Mastering hardware usually involves EQ, compressors, limiters, and sometimes additional gear such as de-essers. Most home studios don't use high end gear for this - they either do it on their computer or simply send their digital audio files to one of many online mastering services and get them to do the work. If you'd like to learn the mastering process yourself then take a look at this excellent resource for beginners: How to master your own music – the basics. MIDI stands for Musical Instrument Digital Interface and it's the main protocol for electronic instruments, controllers, and computers to communicate with each other for sending information about musical notes and control data such as changing patches. These are simply used to let you plug MIDI cables into your computer. Most audio interfaces also have a MIDI interface built in so you generally don't need to get a stand-alone MIDI interface. There are basically two ways of creating MIDI music - you can create it directly in your DAW or a hardware MIDI sequencer, or you can play it in via a MIDI controller. These come in a variety of sizes, typically from 25 to 88 keys, and can have a range of features including velocity sensitivity and aftertouch to additional Pads for input, along with modulation wheels for additional expressiveness such as note bending. Here are the best 25 key controllers sorted by Gearank, and here are the best 49 key controllers sorted by price bracket and the same presentation has been done on our guide to The Best 61 Key MIDI Controller Keyboards. This method of control was first popularized by the Akai MPC60 which was a polyphonic digital sampler released in 1988. Pads have become a very popular method for inputting MIDI data, particularly with DJs and EDM producers, and are used in both live and recorded music production. They range in complexity from being simple input devices to ones that include built-in sequencers and some are even designed for specific DAWs - a good example of this is the Novation LaunchPad for Ableton Live. Akai are still a leader in this space and make many modern MPC systems in both hardware and app forms. Jon Farriss, the drummer for INXS, was one of the first to popularize this technology back in the 1980s when he began using a hybrid combination of electronic and acoustic percussion both in concert and on their recordings. Although it is possible to record with acoustic drums and later convert the tracks into MIDI in your DAW, you will get the most reliable results by using an electronic drum kit. Today just about every piece of conceivable percussion has an electronic equivalent from basic drums to hi-hat,and cymbals. The two great advantages of electronic drums is that they are heaps of fun to use, and once you have your tracks laid down in MIDI you can use samples and synths to make your drums sound any way you want them to in the final mix. One of the most famous brands is the Alesis DM Series which come complete with their own sound engines and libraries of preset kits. See our guide to cheap electronic drum kits for beginners. In a basic home recording setup you'll probably mostly use virtual instruments as plugins in your DAW. However there are still many people who like to use hardware synths and samplers and one benefit of doing so is to reduce the load on your computer's CPU and RAM - some virtual instruments can be very resource hungry. Some people also use them because they prefer the sounds they're able to produce with analog synthesis. Here's a range of additional music production equipment that can come in handy in a project studio, but isn't always necessary. These act as specialized preamps for Electric Guitar, Bass, and Acoustic-Electric Guitars. They also convert the unbalanced instrument signal into a balanced one - this is useful if you have to run cables more than a few yards because they reduce the amount of noise caused by electrical interference acting directly on the cables. Most of the kinds of audio interfaces used in home studios have special instrument inputs so DI boxes aren't always necessary, although using DI boxes in this case can still be beneficial by giving you a more constant signal coming into your interface as the guitarist changes their pick-up and tone settings, or when swapping between different instruments. Some DI boxes also come with added signal processing features - these are like channel strips specially designed for guitars. For more information see our Best DI Box guide. Patchbays are simply used to route signals from one device to another device. For example you might be sending the vocal tracks from your mixer to a reverb unit and back again, but you decide you want to use a different reverb unit sitting in your rack. You could unplug one and plug the other in, but that becomes tiresome and messy once you have a lot of outboard gear. Instead you can have a patchbay which is already plugged into both reverb units and simply take a plug out of one socket on the patchbay and plug it into another one to reroute the signal to your preferred device. If you only have a small amount of outboard gear then you won't need one, but as your equipment starts to build up you'll find you save a lot of time and hassle by using a patchbay. Some microphones require their own power supply - particularly condenser mics. Mic preamps supply phantom power, as do many audio interfaces and mixing consoles, so you generally don't need to buy a separate phantom power supply unit, but they are available if needed. Sometimes you'll find you're getting noise coming into your recording system through the power supply. This is usually caused by appliances in your home such as air conditioners, fans, refrigerators, fluorescent lights and even hair dryers. Most homes have multiple power circuits so the simplest solution is usually to figure out which circuit the offending appliance is on, and take your power from a different circuit. Unfortunately this isn't always possible due to the way your home is wired or because you want to draw more power than the "clean" circuit will allow before flipping the circuit breaker or fuse. If this happens then you'll need to get a power conditioner. Although not usually necessary in a home studio they can come in handy when you have a lot of equipment, and hence a lot of cables, and you find you have noise problems you need to track down. A cable tester will allow you to find which cable or cables are causing the problem. Sound Pressure Level Meters are high-end decibel meters - they let you test how loud a sound source is. If you need precise readings then you can get one of these, but a free alternative for approximate readings can be a dB meter app for your smartphone. Ideally you want the room you mix in to be acoustically neutral - it shouldn't have any reverb or emphasize or reduce any frequencies. You may also want entirely the same thing in your recording room with the exception of some rooms you chose to record in due to their natural reverb. Acoustic treatments are used to solve these kinds of problems. SOS has a very useful resource: A Beginners’ Guide To Acoustic Treatment. Absorption products solve one of the most common problems - that of sounds bouncing and reflecting off hard surfaces. This problem is particularly bad when you have parallel walls that sound bounces between. These types of standing waves produce a frequency of their own - if the sound bounces back and forth 1,000 times per second you'll hear a distinct tone at 1 kHz. For a dramatic demonstration of this effect just go into your bathroom and clap - you'll hear it. Diffusion products scatter audio waves so they don't build up in particular spots and are also good at preventing standing waves. An additional effect of diffusing the sound is that it can make your room sound bigger than it actually is. Low frequencies have long wavelengths that tend to travel along surfaces like walls and build up in corners. This problem is significantly reduced by putting bass traps in the corners. Although they're usually used for drums they can be used whenever you're recording any loud sound source simultaneously with other mic'd instruments or vocals. They significantly reduce the spill between tracks and many modern ones use transparent materials so your drummer can take visual cues from the rest of the musicians. You can start out without using much of this type of specialized equipment, but once you accumulate a lot of recording gear you'll find it's much easier to be properly organized with dedicated studio furniture. You can get specialized desks which are specifically designed for computer based recording. They have places for you computer, computer monitors & keyboard, audio interfaces and studio monitors as well as holes and spots for all your cables to go. Larger ones can also accommodate mixing consoles and even outboard gear. They come in all kinds of shapes and sizes so you shouldn't have too much trouble finding one that suits your needs. At first you'll probably just sit your outboard gear on a desk or makeshift stand, but as the amount of gear you have goes up you'll really need to get proper studio equipment racks. Not only do they help you to be better organized, but they also prevent expensive accidents that can occur when you knock a stack of effects units off the desk and onto the floor. You generally want to place your studio monitors so that your head forms an equilateral triangle with the two monitors. The best way to achieve this is usually to use stands designed for this purpose and they usually come with the added bonus of having dampening pads to prevent vibrations being transferred to your speakers which can happen if you sit them on your main work desk. Here's our list of the best monitor stands. If you're sitting your studio monitors on your desk or workstation then you really need to get a set of isolation pads, after all what's the point in spending good money on your monitors if you let vibrations interfere with the sound? A good example are the Auralex MoPADs. When you're just starting out it helps to keep things simple and then let your range of recording equipment grow as your experience and proficiency grows. Any desktop or laptop computer you've bought in the last few years will be good enough to start with. If you're going to use a tablet then go with the iPad because the Android operating system has problems guaranteeing precise audio timing which in turn means there isn't a lot of good software for this platform yet. Your Digital Audio Workstation is the software you'll use for all your recording, effects, mixing etc. You can plug these directly into your computer without the need for an audio interface. You'll want closed back or semi-open back so you can use them for both recording and mixing. Although you can start with the list above, you'll find it a bit limiting after a short while. This list comprises the core set of equipment found in most computer based recording setups. It can be either Mac or PC. Macs tend to be a little more stable because the hardware is tightly controlled whereas PCs allow for an almost infinite set of hardware configurations and occasionally you'll run into compatibility issues with hardware and driver combinations but it isn't really too much of a problem these days. Macs are also usually a bit more expensive. If you're reading this on a desktop or laptop then you probably already have a good enough computer to start with. I suggest you get one with at least 2 channels that can both accept a microphone input with at least 1 channel also doubling up as an instrument input. The reason is that you'll sometimes want to record in stereo or you'll want a close mic and distant mic and sometimes you might want to record vocals and an instrument at the same time. More channels are generally better so get whatever your budget can afford when you're starting. It's a good idea to choose a DAW that works natively with one of the major plugin formats such as VSTi or AU. This way you'll find it easier to get cheap and free plugins you can use for effects and virtual instruments. Another thing to consider is that many audio interfaces come bundled with an entry level DAW - this is a good option because you'll save a few dollars and you'll be guaranteed the DAW and interface will be perfectly compatible. If you only have enough room in your budget for 1 mic initially, then make it a Shure SM57 - you'll be able to record any sound source with them and they can also double up as live mics if you play gigs. If Vocals and acoustic sources are mainly what you record then go for a condenser mic. If you have 1 set of headphones make them closed back so you can use them when recording without having any of the sound spill over into a mic. Don't use whatever basic speakers are plugged into your computer now. Also don't use any surround sound or Hi/Fi systems you may have for gaming or a home theater because none of these options will accurately portray the music you've recorded. Get the best set of powered studio monitors your budget will allow. There are plenty of inexpensive boom mic stands available to start with - you want one that bends in the middle to allow for accurate positioning. You're going to need a few cables - 3 cables will cover your mic and your studio monitors. Check which connection type your monitors need before buying them - they'll either be XLS or Balanced TRS. Plan ahead and work out which pieces of gear you need when starting out to make sure you get the most out of your budget. Start out with gear that is well recommended but also affordable, and as your skills and your audio engineer's ears develop you'll be in a better position to get the best gear for your home studio going forward. If you have any questions about any of the gear on this page then go ahead and ask in the comments below and we'll do our best to help. Submitted by Mitchel Simmons (not verified) on Apr. 21, 2016. You left gaff tape off your list - you can never have too much of it! Submitted by Jason Horton on Apr. 21, 2016. Actually you are correct - it comes in super handy for temporarily holding gear or cables in place. Submitted by Ricardo (not verified) on Nov. 1, 2016. Submitted by Rhoda Hall (not verified) on Mar. 13, 2018. I'm interested in setting up a home VO recording studio. Any recommendations for a good quality mic for a women's voice recording? AKG C414 Thanks! It's hard to give specific advice without knowing what your voice sounds like, but the AKG C414 is quite versatile and has very good ratings so that would probably be quite a good choice. Submitted by kyeomie@gmail.com (not verified) on May. 7, 2018. Submitted by Jason Horton on May. 8, 2018. We don't provide email support on topics like this, instead you can start by reading this article: Advice On Setting Up A Home Recording Studio. Submitted by mixnthis (not verified) on Jul. 21, 2018.